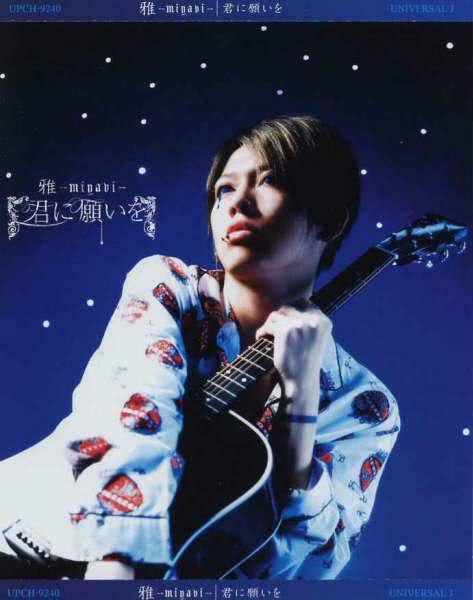 The second Christmas song is Jingle Bell (Kari) by Miyavi. Merry Painful death~winter, Torauma, Screams, Hot Headed~. But it envolves a lot of screaming and very little to do with Christmas. Anyway enjoy Jingle Bell (False). 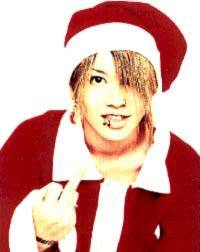 Also enjoy Miyavi making one hot Santa. Former NEWS and Kanjani8 member Hiroki Uchi, has just finished his first solo concerts in Yokohama on December 20-21. He will also being doing more solo concerts in Osaka on January 3-4. 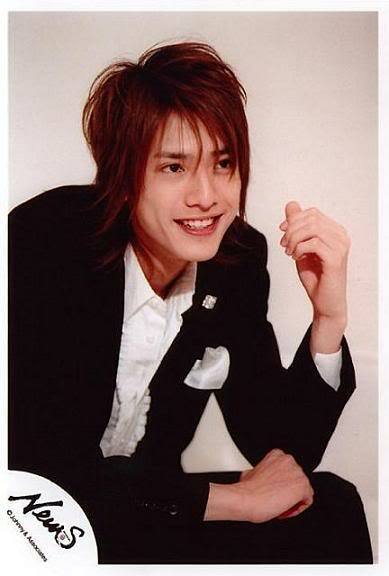 Hiroki Uchi was involved in an underage drinking scandal on July, 16 2005 and suspended from Johnny’s. And also was demoted to trainee in December of 2006. Uchi also made his official come back as an actor during the press conference of Isshun no Kaze ni Nare. It has also yet to be decided whether he will remain solo or rejoin NEWS. It’s obvious that these concerts would decide his fate in Johnny’s Entertainment. As for my take on the whole situation I have a very distinct opinion, which is I don’t care either way. But if you have to do anything with him give him a solo career. And here’s why. Reason number 1: Probably the least legit reason of all. NEWS is better as a 6 person unit. It’s been about two years since NEWS came back, so why change now? If they really wanted Uchi or Kusano back wouldn’t they have already? They could have easily let them be on hiatus for a year, like all of NEWS, and had them rejoin in 2006 with a slap on the wrist. Reason number 2: Uchi isn’t that good of a singer. In my opinion Uchi’s voice is very boring. And I have a lot of trouble even telling when he’s actually singing. His voice fades more into the background. Even his solo lines come off as sounding weird and almost awkward. Reason number 3: You can’t have one without the other. What’s the point of brining Uchi back without Kusano. They came into NEWS together. They both got suspended for similar reasons. They should both come back at the same time. If you only bring one person back it almost makes it seem like what Uchi did was ok or wasn’t on the same level as what Kusano did. But it was the same crime. So that aspect doesn’t make sense to me. Reason number 4: Johnny’s is playing favorites. This really seems like a big slap in the face to Kusano. It almost makes it seem like Uchi has been given special treatment. Kusano’s future in Johnny’s has always been very murky but Uchi has had definite plans. He has come back as an actor, while there has been no official word as to what Kusano’s doing. If he wasn’t in Shoentai Playzone with Uchi he wouldn’t have done anything since being suspended. Reason number 5: If they keep any member it should be Kusano. I can honestly say that Kusano is a better singer than Uchi. If you compare their voices in Teppen or even Fiesta Kusano’s voice outshines Uchi’s. Kusano is a very talented singer and was even given more lines in NEWS than Uchi got. Reason number 6: Pairing madness. 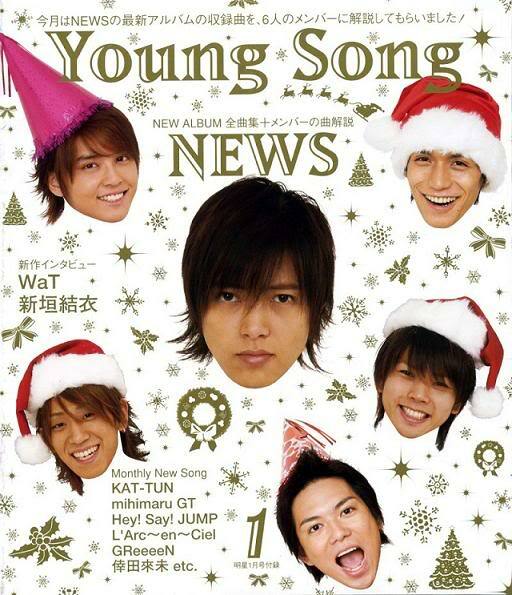 Most fans of NEWS know that the current members of NEWS are paired up for singing and fangirl reasons. The current pairings are RyoPi, KoyaShige, and TegoMass. Uchi being back in NEWS would throw off the whole balance. It really can’t be RyUchiPi. Could it? This reason isn’t really legit either, but it’s just a thought I had. There is still one aspect I am not clear of. Just how popular is Uchi? Uchi was in both NEWS and Kanjani8. But was that based on vocal ability or just the fact that he was from the Kansai region of Japan. I wasn’t a NEWS fan when Uchi was a member, so I have no idea how popular he was or still is. There is only one completely stupid and fangir-ish reason why Uchi should return to NEWS. And that reason is Uchi and Ryo were really good friends. And I think Uchi returning to NEWS would make Ryo very happy. I’M LAME! Since it’s getting really close to Christmas I thought I’d post one Christmas song a day until the 25th. Some of these songs are more winter songs than Christmas but that’s ok.
A snow themed song about winter love. Sure to get you in the holiday spirit. Wow this song flew right under my radar. I haven’t kept up with Tommy Heavenly6 lately, because I assumed since she was back with The Brilliant Green she wasn’t going to release solo stuff for a while. She didn’t even make it clear whether she would continue here solo projects or not. But what they say about assuming is true. Tommy is finally back! And I couldn’t be happier. It’s almost been two years since her last solo release, Heavy Starry Chain. But the wait is worth it. I am a HUGE Tomoko fan. I fell in love with her after I heard Rainy Days Never Stays. Anyway, Paper Moon was released on December 10, and is the second opening theme for the anime Soul Eater.The song is pretty good. My only complaint is that it sounds like every other song she’s done. The music itself sounds like a mix of three other songs by her. And the lyrics are very Tommy like. A bunch of random English lines thrown in. Her lyrics are always cute and on the border line of almost not making sense. 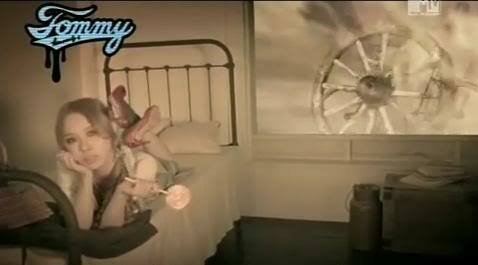 As for the video, it has a Wizard of Oz theme. Which I don’t like. I think I’m the only one on the planet who hates The Wizard of Oz. 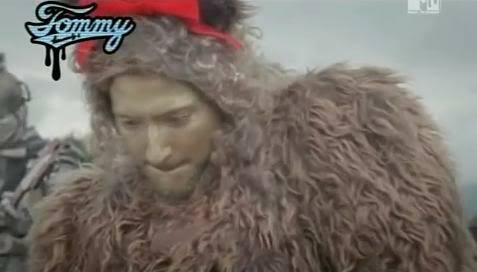 Tommy always has the weirdest videos. And most of the time are connected or a continuation of sorts. Move over Tommy this is my video! Tommy video is SERIOUS BUSINESS. Is that a tornado? Eh who cares. Enjoy the video Tommy fans! With 2008 coming to a close, it seems like an end of many things. Elder Club, Haramoni@, and possibly Leah Dizon. And it seems like you can’t turn on the TV without seeing some sort of yearly countdown show. So, I decided to make my top 20 songs of 2008. I’m sure the songs I picked are probably not the most popular or best selling songs of 2008. 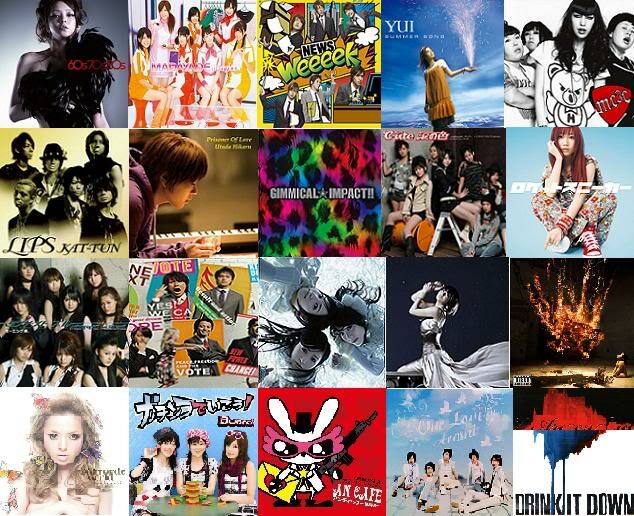 Mostly because a huge chunk of the music I listen is Hello!Project, NEWS, and random Jrock bands. I didn’t even bother to listen to 3/4 of the songs that made in on oricon’s top 100 singles of 2008. But that’s not important. I also limited it to one song per artist so it’s not like NEWS, NEWS, NEWS, Ai Otsuka, NEWS, NEWS, NEWS. I’ll also give a short explanation of why I picked each song. Number 20: I’m actually a really big LM.C fan. And this song is pretty much amazing. 88 was so close to beating this, but I think the fact that Aiji sings in this song made it better. Number 19: There are only a few Ayumi songs I actually like, while this song isn’t my favorite by her I still think the song is good. It’s sung very well and I absolutely love the music, it’s very mysterious. It’s so low on the list because the lyrics in my opinion are weird and repetition isn’t always key. Number 18: Even though I am not really fond of ballads, I can’t deny how great this song is. Kumi’s voice is really suited for ballads ad she sounds amazing in this song. And the lyrics are so sad, I get choked up listening to them. Or maybe it’s just seeing Kumi cry. Number 17: Being a pretty big Gazette fan I kinda expected more from them. The song is very pretty but I prefer Gazette’s heavier songs. I don’t really care for this monster ballad. Number 16: This is defiantly my favorite C-ute single in 2008. It’s another sad song. But it’s not overly sad, since it is a song about saying goodbye and feeling refreshed. While this song is good it’s not good enough to be placed higher on my list. 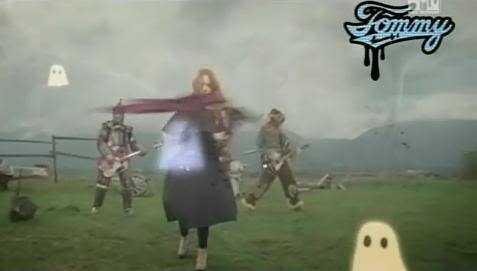 Number 15: This is actually the second song I’ve ever heard by L’Arc~en~ciel, Ready Set Go being the first. I never really noticed before how good of a singer Hyde really is. Since I can’t find a translation for this song, this is based on how it sounds alone. And the music is awesome, creepy but almost toned down. And Hyde is looking hot in the video. It’s strange because I don’t really think he’s attractive any other time. Number 14: I’m not really a big Arashi fan, this is one the second song I’ve heard by them. But since Jun Matsumoto is hot I think I listen to them more. This song is so sweet. Leave it to a Johnny’s group makes me swoon over their song. Number 13: I really love the overall sound of this song. And it’s apparently about summer. But I love all An Cafe’s songs. Number 12: It was really hard to choose the overall best Perfume song of 2008, Love The World came so close to winning. But this song is just awesome. I’m a big Perfume fan mostly because I’m a big techno fan. I am also very captivated by Perfume’s cute voices. Number 11: This is actually one of my favorite Buono songs. I think everything about this song is just amazing. But the music is really a huge factor. And of course the always cute Buono lyrics. Number 10: I really love how this song is a dis to the Japanese media. The lyrics are really powerful. Her English isn’t that great, but you have to commend her singing entirely in English. But I kinda hate the hair she’s sporting in the video. Number 9: What can I say, I can’t get enough of Madayade. It’s probably my absolute favorite Berryz song. Everything is just perfect in this song. The beat and the music is amazing. And everyone’s voice sounds incredible. Plus the uber catchy chorus, just awesome. Number 8: I always thought KAT-TUN was kinda terrible, but this song has certainty changed my mind. I think Kame and Jin looking hot in the video is a big reason I like the song so much. But I really love the rock music, which you never really hear in Johnny’s songs. The lyrics are pretty awesome. “Those red-drenched lips, I want to get closer to you and destroy them, violently.” That’s pretty epic. However I doubt I’ll become a KAT-TUN fan. Number 7: Even though I wasn’t a big fan of this song at first, I have really grown to love it. Even though you only really hear Ai and Reina, they are the strength of Momusu and make this sound really good. And I think the lyrics are really good. Number 6: Ai Otsuka really is “The New Guru of Love.” She delivers another really sweet love song. But I’m not exactly sure what an Earth number is. I really love Ai’s voice though. It’s so adorable and yet also beautiful. 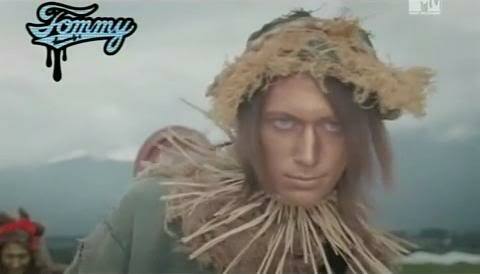 Number 5: I usually find Kanjani8, for the most part, really annoying. But this so is so crazy, it’s great. I can’t stop listening to it! And Ryo being in it helps too. Jajajaja~n. Also why was a song about the economy so popular? Number 4: I blame the drama Last Friends for making me like this song as much as I do. But Utada Hikaru has an amazing voice and she sounds just incredible in this song. I’m just a prisoner of love to this song. Oh that was a terrible joke. XD Number 3: I love this song so much. The positive message and the overall happiness of this song is just infectious. I can’t help but love it. And everyone in NEWS are great singers. Number 2: This song is so amazing. I love how she sounds during the chorus it’s so awesome. And I love the nostalgic-ness of the lyrics. This is just a pretty and upbeat song about summer love. This song really just makes me happy every time I listen to it. And also kind of sad because it makes me think about how quickly my youth will be gone. Number 1: Namie made a truly amazing song. I’ve listen to this song at least 60 times since it first heard it. I’m in love with 60’s and mod fashion, so on that alone the song is awesome. But I just love the girly lyrics. How it’s all about hair and fashion. There you have it my favorite songs of 2008. I’d really like to hear what everyone else thinks the best song of 2008 is. 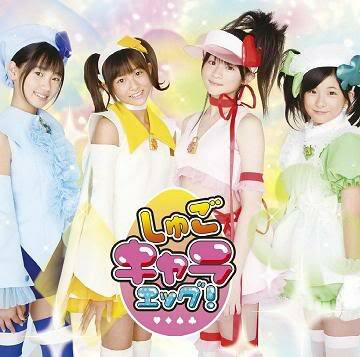 Shugo Chara Egg’s debut single Minna no Tamago is being released December 10, or today. And the PV has been out for a few days now. I’m late on reviewing again. But at least it’s not by that much. The video is extremely colorful. Lots of floating colofulness. 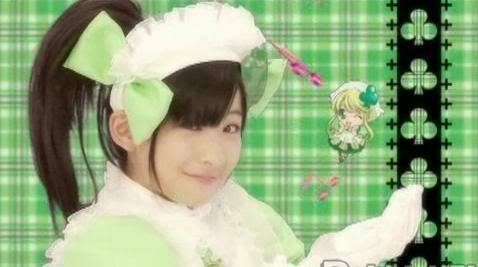 I love how this Shugo Chara group is actually focusing on the anime. With the matching costumes and clips of the anime. But the dance is way too simple. I though Buono had the simplest dances in H!P but this tops it. Yeah the dance is cute, but it’s just too simple for my taste. All the seem to be doing is walking. Even though there is a lot going on in the video, it almost seems like it’s too much. And I really don’t care for the video. 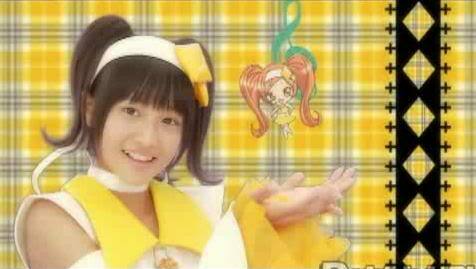 Even though this a H!P Egg group I expected this song to be a little more mature because of Buono’s songs. Buono’s songs are childish but still kinda mature. For what the song is it’s good, people who expected more of this song should remember it’s just for Shugo Chara. But I like the song. It’s cutesy and is catchy. I’ve been listening to it on a loop. Though I’ve already heard this song a lot because of the fan recording that was out a few months ago. And everyone’s voice is incredibly cutesy, except for Saho Akari. Her voice is the most mature of the bunch. Wada Ayaka’s voice is a mix of cute and mature. This song really does seem to be a continuation of Kokoro no Tamago. It was even written by the same person. But instead of hop, step, jump, it’s pyon pyon fumu fumu. And other lyrics of the song are very similar. The lovely people at projecthello.com translated the lyrics if you want to see for yourself. Surprisingly this song reached 5th on the oricon. Which means we’ll probably be seeing a lot more of the Shugo Chara Eggs. 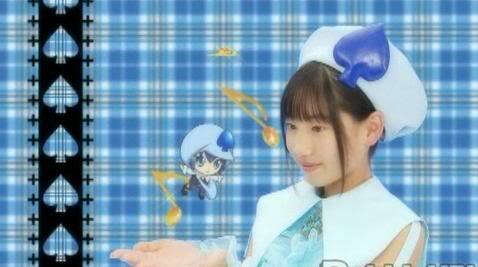 And maybe if they become popular enough they will be able to branch away from Shugo Chara like Buono did. And I also expected by the time the single came out they would have some sort of official name. As for now they are just Shugo Chara Egg which seems silly to me. 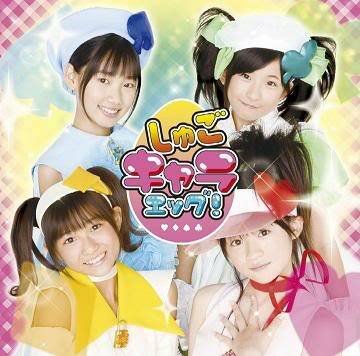 I was always overly excited for this group because Maeda Yuki was in it. I feel in love with her voice in High King. But Kanon is defiantly my favorite. I even think her voice is the cutest in this whole song. It must be because she looks a little bit like Aibon. 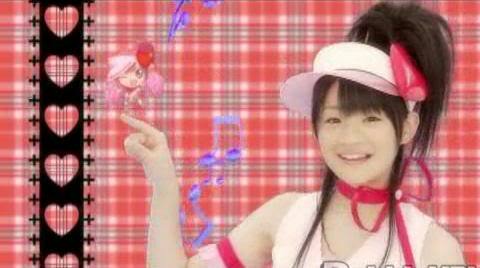 I think I’m already Kanon biased. I found the best Miyavi news in a long time. 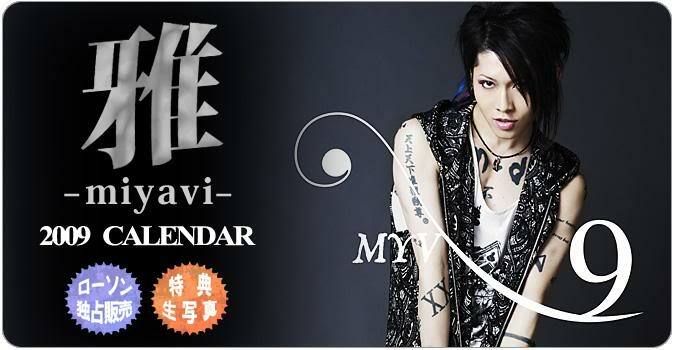 Miyavi has finally changed his hair! About a week ago I happened to come across PSC and Miyavi’s 2009 calendars. His hair is on the normal side now. It’s a mix of his oresama hair and his kekkonshiki no uta hair. 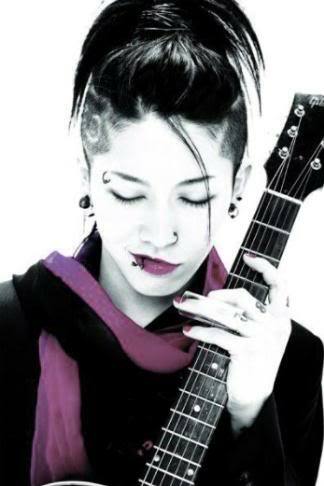 And as a huge Miyavi fan I am pretty much rejoicing. 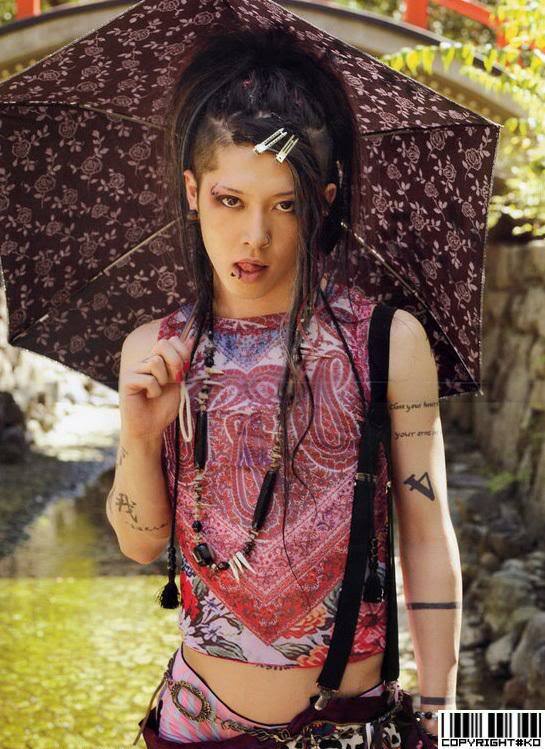 So let’s take a trip down Miyavi’s ugly hair memory lane. 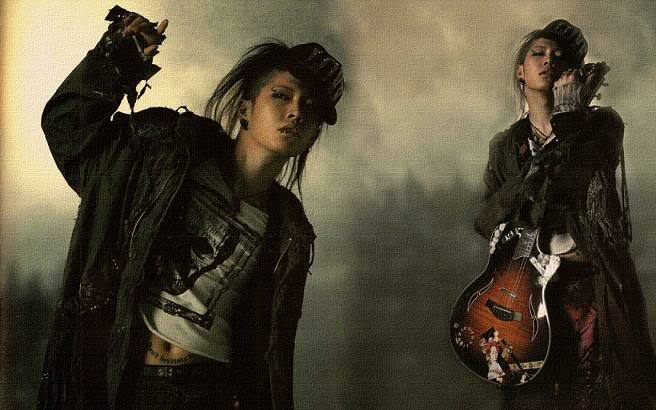 Miyavi’s hair in this PV isn’t bad at all. But it’s the beginning of the end. This is just the last time his hair actually looked decent in a video. 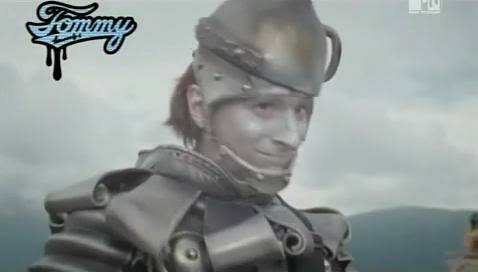 I love this video, MYV looks gorgeous with his blue contacts. The song as a whole is really sweet also. And the ugly hair begins. My first reactions to this is, “what’s going on?” He shaved both sides and put the rest in some sort of ugly pony tail up-do. The overdose of pink in the promo photos didn’t help either. I didn’t like that he was starting to look more girly. And to this day I have yet to watch the PV because I can’t get passed his hair. I guess that makes me a bad fan. But I really like the song. “Love me because I love you” I can relate to that. ._. The beginning of Neo Visualizm. My face dropped to the floor when I saw this video. It was curly and it had fake hair pieces in it. It was also pinned and put in a stupid hat. I was a little hesitant to listen to this. His style went way over the top and it was a different type of music then he usually did. And his black outfit with the gloves turned me off the video completely. And for a while I wouldn’t even watch the video. His hair in this video annoyed me so much. He had more hair pieces and it was braided. And the hair looked dry and dead. It was just terrible as a whole. But his clothes were more toned down and almost normal looking. This song was my favorite out of all of them. It had less “hip-hop” influences.Now this post as a whole must sound very shallow and fangirl-ish, but looks would never stop me from listening to his music. 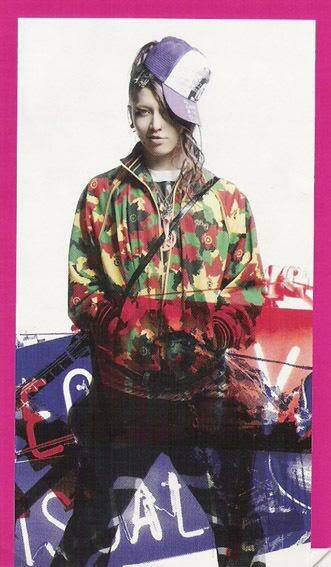 I gradually got passed his ugly hair, once I realized his lyrics didn’t change, just his style of music. 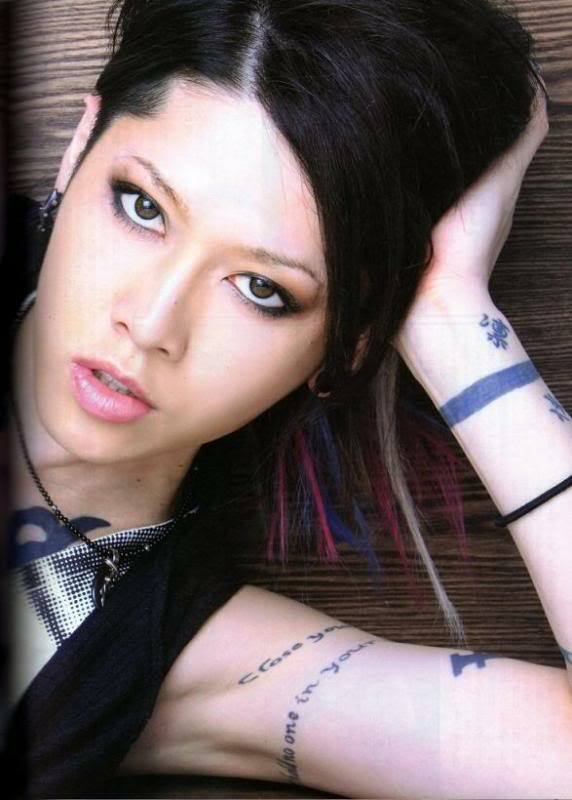 And I reluctantly accepted his change because Miyavi never keeps the same hair for that long. His new hair is ok looking. I hope he doesn’t keep the stupid multi color hair extensions. But his hair might not even last like this for long. I guess I’ll have to wait for his next single.